Do you have a recreational property that you want to keep in your family? Divorce. Bankruptcy. Spendthrift children. An heir with a disability or special needs. A lawsuit against one child. These are all issues that drag your property in the mess that others created. A Cabin Trust protects against these issues. Simply put - a Cabin Trust is a legal document that can protect a cabin, cottage or recreational property for your family. Protection from what? Well, protection from probate, lawsuits, higher property taxes, nursing home costs, family disputes, and even your son or daughter’s future ex spouse -- just to name a few things. A Cabin Trust is designed to solve these problems before they start. This site is designed to help answer some questions about why anyone who owns a cabin shouldn’t be without a Cabin Trust. Probate can cost thousands of dollars. Tax increases can cost even more. A lawsuit could cost you the entire value of your recreational property. The mistakes a child makes could likewise have a huge cost. A nursing home stay could put your property at risk. A conflict within a family costs more than money. A Cabin Trust was designed to avoid these costs. If property is titled in your name, you are personally liable for any claims against the property. These claims could include injuries suffered from guests - or even trespassers. While property insurance is always the first line of defense, most policy limits average $300,000 in protection. That means that any claims that exceed your policy limit are your responsibility. Your personal assets are at risk - including your home and pension. A Cabin Trust uses a limited liability company to create a liability shield between your cabin and your remaining assets. Property left in your name at death must be probated in order to pass it to your children. This is a process that can take many months and cost thousands of dollars. It also allows for contests. You could avoid probate by signing a deed making your beneficiaries joint owners while you are alive. Unfortunately, this would result in a loss of a step-up in capital gain cost basis - which, with escalating property values, could cost your family far more then even the cost of probate. But a Cabin Trust avoids probate and the negative consequences of using a simple quit claim deed. If your goal is to leave your cabin to your kids they are going to need a rule book. If not, the conflicts can begin as soon as you are gone. What if two families want to use the cabin Labor Day weekend? What if one won’t pay their share of the taxes, insurance and maintenance costs? Who is going to decide if the roof needs to be fixed? What if one child wants to sell their share to a non-relative? These are just a few of the problems that can arise. A Cabin Trust is a rule book to resolve these issues. There are various options that we can incorporate into your family’s Cabin Trust so the rules are set by you. Remember - even a family with 2 children who get along wonderfully can quickly turn into a room full of grandchildren and step-grandchildren who all look at your cabin with different motives. 4. Protection from Children’s Problems. Divorce. Bankruptcy. Spendthrift children. An heir with a disability or special needs. A lawsuit against one child. These are all issues that drag your property in the mess that others created. A Cabin Trust protects against these issues. Changes in ownership from one generation to the next can result in a large jump in property taxes. Second properties already are far more heavily taxed because they don’t have the Michigan homestead exemption. Additionally, when property is retitled by a deed, will or living trust to your children, the Headlee cap is removed for 1 year, and the local treasurer raises your taxable value (capped value) to your state equalized value (SEV). This can result in a large and immediate property tax hike. In contrast, a property kept in a Cabin Trust avoids this increase. 6. Protection from Nursing Home Costs. One of three people end up needing assisted care in an institutional setting at some point in their lives. A prolonged stay in a nursing home can quickly erase a lifetime of savings. While a primary residence is currently protected from long term care costs in Michigan, a second property is not. It must be sold to help pay for these costs if you seek assistance for your care. A Cabin Trust is designed to protect against this scenario - even with the newest Medicare rules enacted in 2006. Property in the Cabin Trust is not countable against nursing home costs, provided it is done sufficiently in advance of this need. Probate can cost thousands of dollars. Tax increases can cost even more. A lawsuit could cost you the entire value of your recreational property. The mistakes a child makes could likewise have a huge cost. A nursing home stay could put your property at risk. A conflict within a family costs more than money. A Cabin Trust was designed to avoid these costs. For the price of about a year of homeowners insurance, you can lessen or eliminate these costs for generations to come. 8. Creates a Family Legacy. Stop for a moment and forget about all the problems, conflicts and costs detailed in the last seven paragraphs -- and refocus. You bought your cabin because you wanted a place to go to create family memories. Fishing, snowmobiling, hunting, and walks in the woods have been been a part of our up north tradition - not to mention Friday afternoon traffic on I-75! Most families have spent some of the happiest moments of their lives together up north. In the last decade, property values have jumped significantly. That is great for those of us who already own property in northern Michigan. But it also means that values are so high that many people in the next generation simply won’t be able to afford a place of their own. A Cabin Trust can create a family legacy. This rule book allows the continued use and enjoyment of your place up north for generations to come - customized for your family. This can be a legacy to be proud of. How much does a Cabin Trust cost? Most Cabin Trusts that we prepare cost $1500. This includes the consultations with the attorney and the drafting and execution of all the necessary documents. There is a $50 filing fee with the State of Michigan, and a $17 fee to record your deed. That is it. Several generations of protection for about the cost of 1 year’s homeowners insurance. In less than 10% of the cases we handle, we do reserve the right to charge more if there are special circumstances. This would be clearly explained after the first appointment (for which there is no charge) and you would then decide before any documents are drafted. How long does it take to complete a Cabin Trust? We complete most Cabin Trusts in 2 appointments that are typically scheduled 1 week apart. Some clients would like to have their children present at one of the meetings, and this can be arranged. Additionally, we can accomplish the entire process through telephone consultations and mail. If I have a Living Trust, do I still need a Cabin Trust? Yes - particularly if your intent is to keep your recreational property in your family beyond the time of your death. A living trust is a terrific way to avoid probate. However, most trusts are settled in the months after the trust maker’s death. A Cabin Trust can last multiple generations. Likewise, a living trust affords no liability or nursing home protection -- or protection for a child who has problems of their own. A Cabin Trust addresses these needs, and thus together with a living trust, makes your estate plan more powerful. What if several people already own our cabin? Then a Cabin Trust works just as well -- before there are conflicts. We often create a Cabin Trust for co-owners whether they are related or not. Sometimes it is a group of friends who decide to purchase a hunting cabin together. The Cabin Trust protects each member from liability and the problems of one owner. Plus, they can keep the property in the managed care of their children and grandchildren - if they so choose. Who has to sign the Cabin Trust? Any person whose name is currently on the deed must sign the documents creating the Cabin Trust. Some families want some or all of the children or grandchildren involved in the creation of the trust. This can be accommodated. What type of Trust is a Cabin Trust? A Cabin Trust is a hybrid of four different estate planning tools: a revocable living trust, a legacy trust, an asset protection trust and a limited liability liability company. 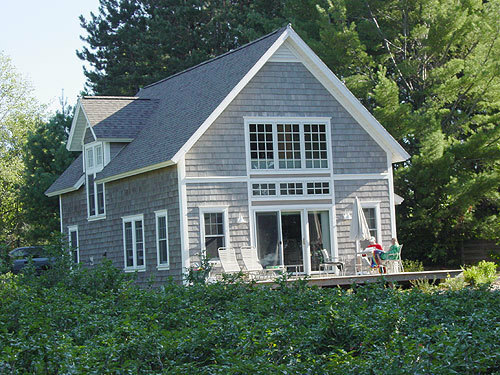 It has elements of all four -- but is uniquely designed to deal with the problems and issues specific to Michigan cabins and cottages. Can’t my attorney draft my Cabin Trust for me? Probably not. Most attorneys don’t specialize in estate planning and tax law. The O’Bryan Law Firm does. Further, after several years of research, development and the preparation of documents for so many families, the O’Bryan Law Firm has established a copyright on our Cabin Trusts. In fact the term Cabin Trust is registered trademark owned by the O’Bryan Law Firm, PLC with both the State of Michigan and the US Patent and Trademark office. What if I don’t plan to leave my cabin to my children? You can still benefit from a Cabin Trust by protecting yourself from lawsuits, and sheltering your Up North property from nursing home costs. Further, if you later decide to leave the cabin to your children, they can then have the choice to use the Cabin Trust. What if decide to change our Cabin Trust? For fifteen years, the O’Bryan Law Firm has maintained the policy that we will not charge for minor trust updates. We want the estate plan you complete through our office to be current and effective when the time comes for your family to utilize it. Explain the process of getting a Cabin Trust? First, you call and schedule a no cost appointment. We will mail you a packet with a short set of forms to get you started. You meet with Attorney O’Bryan for a consultation which usually lasts about an hour. Next, we draft your documents, which are ready to be reviewed and signed at the second appointment. This is when you pay any fees owed. That is it. The final documents can be picked up or mailed to you. Call and schedule an appointment. This is a decision that can create a legacy that can last many lifetimes... all it takes is some action on your part now. The Cabin Trust protects each member from liability and the problems of one owner.